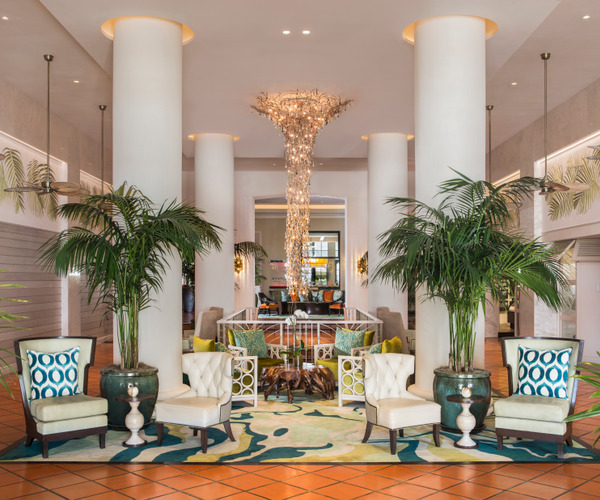 With its private beachfront, flowering foliage, and seaside swimming pool, the AAA Four Diamond-awarded Palms Hotel & Spa is a relaxed, tropical retreat just minutes from South Beach’s pulsing action. At the center of this sophisticated Miami Beach–based oceanfront property is its commitment to wellness and inspiration from nature. Award-winning natural gourmet cuisine is served at the hotel’s signature Essensia Restaurant, and the on-site Aveda Destination Spa, a full-service spa, salon, and retail center, combines all-natural services with chic touches like outdoor spa cabanas and in-room iPod docking stations, allowing guests to control their own tunes during treatments. Guests of the spa, a 2010 Spafinder Wellness 365™ Readers’ Choice Awards recipient, have access to The Palm’s tropical gardens, heated pool, and sandy beach. This AVEDA Spa at the oceanfront The Palms Hotel & Spa in the heart of Miami Beach is dedicated to restoring balance and wellbeing through its Ayurvedic holistic treatments, which utilize all-natural and botanical ingredients. Offerings include Deep Tissue, Chakra Balancing, and Ayurvedic Rejuvenation massages; Perfecting Plant Peel™ and Botanical Skin Resurfacing facials; Stress-Fix™ and Aqua Salt Glow body polishes; and waxing, nail, hair, and makeup services. The 80-minute Palms Signature Massage begins with an aqua salt glow exfoliation in the spa’s self-contained HydroCapsule, followed by a steam bath and customized Aveda Aroma Massage, which incorporates various modalities to meet each spa-goer’s needs. The 5,000-square-foot spa has five treatment rooms—including a couple’s suite with experience showers and a hydrotherapy room—along with two outdoor tiki treatment cabanas. Additional amenities include a salon, retail area, and indoor/outdoor relaxation lounge equipped with a coed steam room; the hydrotherapy space features the HydroCapsule, which incorporates aromatic steam, a Vichy shower, and color therapy. Spa decor mirrors its seaside surroundings, providing a serene yet elegant feel. 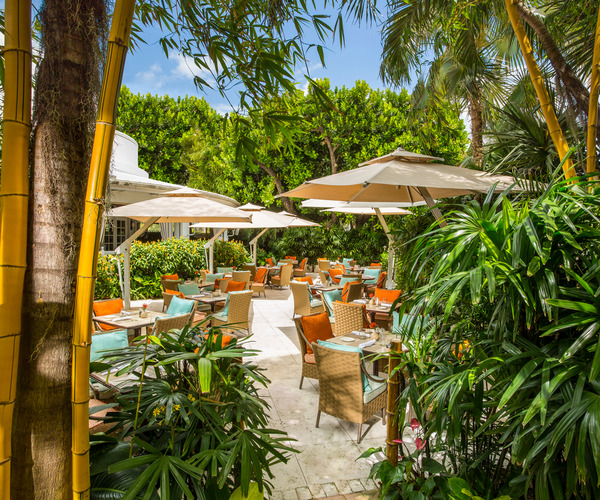 Tropical garden pathways lead guests to the beach, where they can spend the day in the surf or sunbathing on lounge chairs or under umbrellas, courtesy of the hotel. Adventure seekers can arrange nearby snorkeling, scuba diving, jet skiing, and deep-sea fishing excursions via the concierge, while sports enthusiasts can take advantage of area tennis and golf facilities. The hotel staff is also happy to plan tours of Miami and jaunts to the Miami Seaquarium, Key Largo, Key West, Parrot Jungle, and Sawgrass Mills shopping complex. Additionally, guests have direct access to the city boardwalk, and the trendy area of South Beach, famed for its upscale shopping, culture, cuisine, and nightlife, is just steps away. On-site, The Palm’s fitness center comes complete with Precor equipment, including treadmills and as elliptical cross trainers™ with individual TVs. There is also an oceanfront swimming pool. The Palms Hotel & Spa has 251 guest rooms and suites, many of which offer serene sea views; others overlook the property’s tropical gardens or the cityscape. Accommodations come appointed with custom-designed wood furniture, work stations, sitting areas, and, in some cases, spacious balconies. Interiors are designed in neutral color palettes accented by vibrant splashes of turquoise and orange, and come equipped with wireless Internet access and plasma TVs. Agua-hued mosaic-tiled bathrooms reflect a spa-style setting, complete with rain showers. At Essensia Restaurant, international gourmet meals are prepared with an emphasis on local and sustainable ingredients, creating a fresh, wholesome culinary experience. Organic or biodynamic wines can be ordered to complement dishes, which include low-calorie spa selections. Open daily, the Essensia dining room welcomes guests with nature-inspired decor and a romantic, laidback vibe; as well, guests can opt to dine alfresco on the terrace and poolside deck.